Please visit me on Medium at https://medium.com/soma-integral to check my latest posts related to Regenerative Development for Organizations and Place-Sourced Communities. 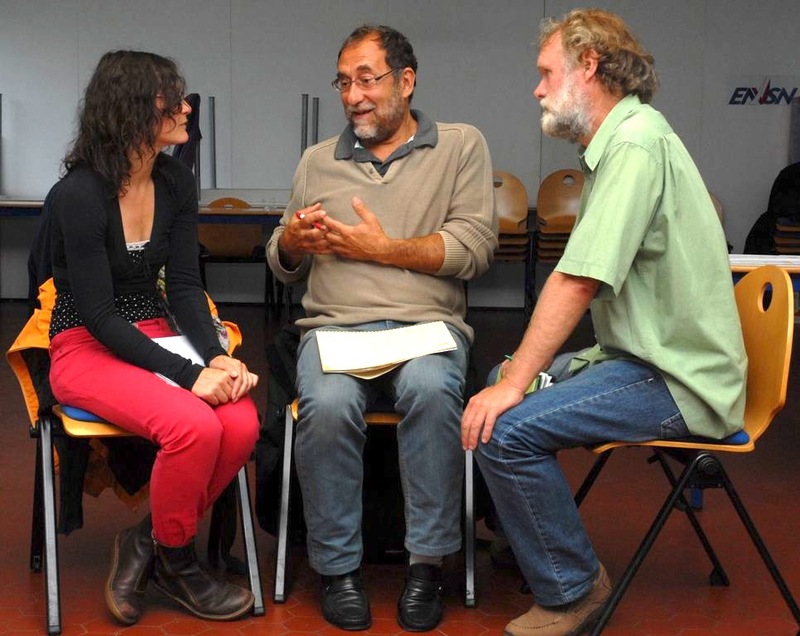 This is PART 2 of a two-part series about my unique experience facilitating a Regenerative Development workshop in Brittany, France, this past August. PART 1 describes my intentions for the workshop, the process we went through over the 2.5 days, and highlights the key elements that I believe made the workshop a success. PART 2 presents our case study of the village of Crucuno where an ecovillage project is being planned; and the regenerative potential we uncovered for the project and the village. The Pays d’Auray on the Bay of Quiberon in the Morbihan, South Brittany, is undeniably one of the most beautiful regions in France. 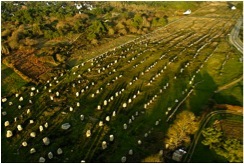 The fact that the whole area includes an exceptionally dense collection of megalithic sites (such as, for instance, the Carnac alignment shown on the picture on the right) makes it a unique and mysterious area. More than 3,000 prehistoric stone formations including alignments, tumuli, dolmen and menhirs have been erected there; many more are still hidden underground. 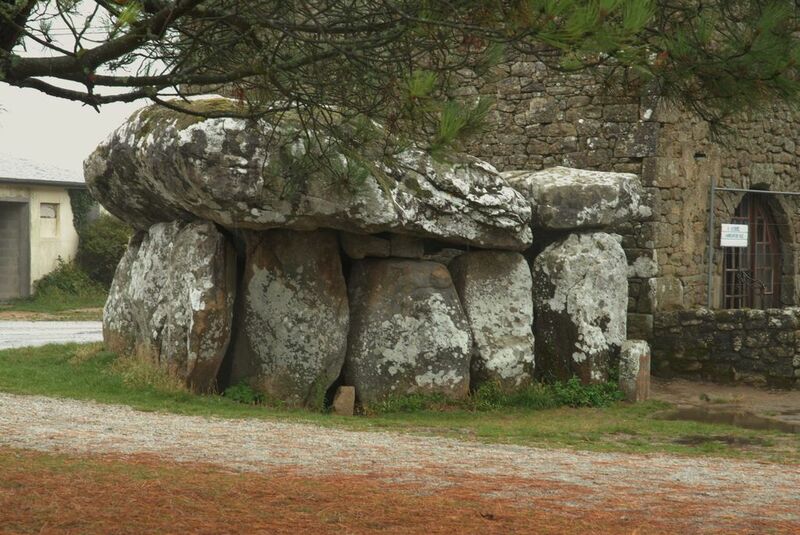 A huge dolmen, built c. 4000 years BC and classed as a historical monument, is located at the center of the village on the main plaza, in the municipality of Plouharnel. It consists of 9 massive standing stones supporting a 7.6-meter horizontal slab weighting more than 40 tons. The existing megalith is only the remaining element of a bigger monument—a tumulus, which included a 24-meter tunnel, the whole structure being originally entirely covered with smaller stones and earth. Over the years, people removed the smaller stones to build houses in the village. A house was built just a couple of feet from it, which seemed a violent refusal to acknowledge the likely sacred origin of the dolmen. That house has not been inhabited for many years and there are stories of illness and dysfunctional behavior in the family that occupied it. According to two megalith experts, Howard Crowhurst and his son David Crowhurst (who gave us a tour of the village), the dolmen is geometrically related to other megaliths in the area, including the “Quadrilatere” (another large arrangement of large stone a 10 minute walk from the dolmen) as well as the alignments in Carnac (see above picture), a town about 10 kilometers south of the village. Crucuno is being considered for addition to the UNESCO World Heritage’s list. Originally the village was mainly agricultural to support the local families. Today, farming has disappeared and many non-local people come here to retire. The village includes about 40 habitations, 4 or 5 of them being currently vacant. Crucuno seems lifeless but for the main road that cuts the village in two, which we were told, is mainly used as a shortcut to nearby towns by speeding cars. It is primarily a dormitory for families who work in the local towns of Auray or Vanne. The village has no school; no café; no grocery store; not even a church. An incinerator was built not far from the village, slowing down new developments and keeping property cost low. In 2014, a group organized against the incinerator hoping to have it closed while arguing for more ecological ways to manage waste in the area. Now a man in his early 40’s, Jérôme Collet remembers visiting his grandparents who lived in Crucuno when he was a child (his grandmother still lives in the village). He decided to settle in the village late 2012 with the idea of building an ecovillage based on co-living spaces on a property he owns. Jérôme has an immune system disease and coming back to the countryside was for him an attempt to return to a more healthy life after an early productive career working for an industrial firm. His goal is to create a more conscious ways of living including new approaches to habitat, growing food, healthcare, education, mobility, clothing, and so on. Jérôme’s project is inspired by the Movement Colibris, an organization created by Pierre Rhabi who is one of the pioneers of ecological agriculture in France and internationally renown for his work against desertification. 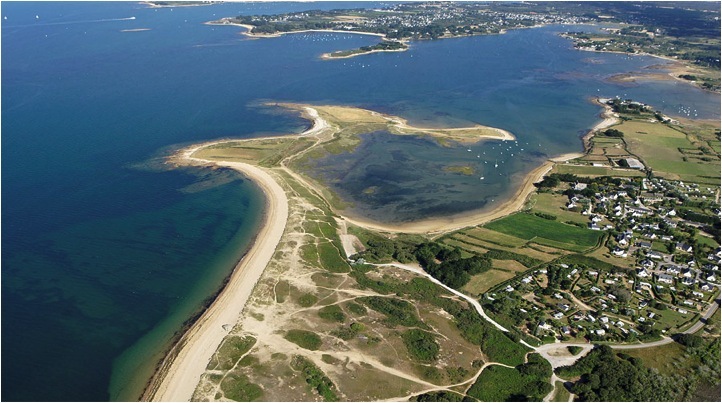 Project Oasis is the organization’s most recent project aimed at facilitating the creation of hundreds of inspirational ecological and co-living places in both urban and rural French areas in less than 5 years. This September Movement Colibris is launching a national campaign with a goal to engage 36,000 French mayors in the Oasis projects. A few of such projects have already been built in France. During the workshop, we considered Jérôme’s project as part of a three-nested system framework (i.e., a holarchy) as shown on the picture. In a holarchy each system’s purpose is to support and generate value for the system within which it is nested. While the ecovillage project has a huge potential to play a regenerative role for Crucuno (the ‘proximate whole’), defining the ‘greater whole’ was less obvious for the group. We felt that the relationship was not geographical; instead, we believed that once it has retrieved its vibrancy and life, Crucuno could become a demonstration village with influence well beyond the local region. This impact could easily be amplified if the ecovillage became an official ‘Project Oasis’ within the network currently created by the Movement Colibris. We found that the regenerative potential of Crucuno was extensive and, if realized, it could affect the ‘Five Capitals’ usually considered in a regenerative project: Human, Social, Ecological, Financial and Manufactured/Produced. Some ideas that we explicitly discussed during the workshop included, for instance, the need to rediscover local practices that were used in the “old days” to bring back local craftsmanship, thereby increasing human capitals. The social capital could be enormous as long as the project and diverse interventions in the village enliven the interest, will and engagement of both local and new inhabitants to regenerate Crucuno, and help them rebuild relationships that have previously been broken. There is a need to reawaken peoples’ self-esteem in order to, for instance, overcome the pattern of alcoholism that has plagued the village. We suggested creating a new local school since there are quite a few children, including Jérôme’s children, in the village. 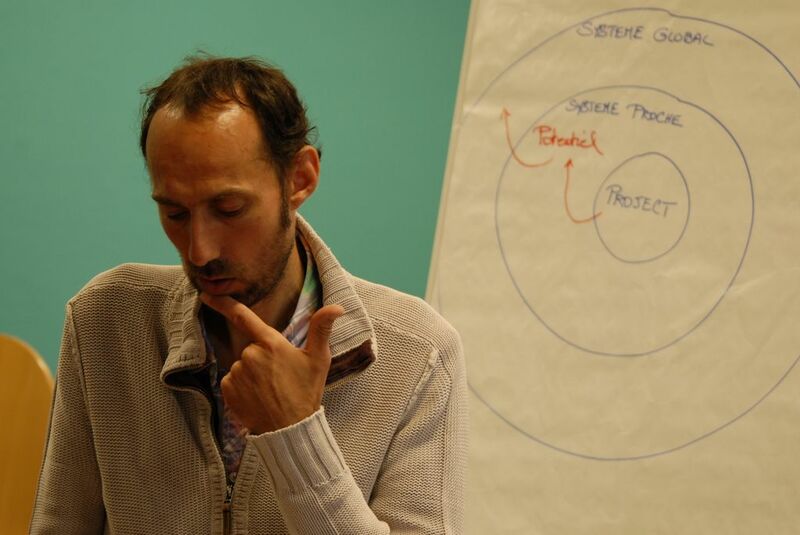 Jérôme is greatly interested in encouraging local farmers and perhaps young people to develop bio-agriculture and permaculture on unused agricultural land. A regional campaign to find new ways to manage waste could facilitate the closure of the incinerator, freeing new land for development and, thus, generating new ecological, financial and produced capitals. Beyond the development of the ecovillage, many in the group mentioned the need to rehabilitate existing vacant buildings, increasing the built capital of the village. It will also be important to keep a close watch on the UNESCO World Heritage’s list as such a label comes with both positive outcomes (e.g., funding opportunities, revenues from tourism, etc.) as well as potentially negatives ones such as loss of tranquility, pollution, unwanted and undesirable development and so on. There is nothing more rewarding to me than the knowledge that a small group of well-intentioned individuals can over 3 days re-energize their levels of Being and Will to continue to passionately drive the planning, design and development of a project with the potential to regenerate a local community, if not a region. My humble contribution was to simply create a structure and facilitate a carefully designed process while providing some guidance. The village of Crucuno revealed its identity, vocation and desire for becoming to those who knew how to see and listen. The professionals involved observed the patterns and synthesized what they saw and heard while remaining connected to their hearts. Indeed, the whole workshop was impregnated with the participants’ love and care for the village as well as for Jérôme and his project. Love, perhaps that’s the secret sauce! This is why I do this work! These notes are PART 1 of a two-part series about my unique experience facilitating a Regenerative Development workshop in Brittany, France, this past August. PART 1 describes my intentions for the workshop, the process we went through over the 2.5 days, and highlights the key elements that I believe made the workshop a success. PART 2 presents our case study of the village of Crucuno where an ecovillage project is being planned; and the regenerative potential we uncovered for the project and the village. As I prepared for the workshop, I was reminded by my colleagues at the Regenesis Group that, beyond the development of my presentation and the design of the process itself, it was critical I prepare myself, i.e., be clear on my intent and purpose, my state of being and my will during the workshop. This was a great reminder of what Bill O’Brien, who served as CEO of Hanover Insurance, once said when asked to sum up his most important learning experience in leading profound change—he responded, “The success of an intervention depends on the interior condition of the intervener.” To that end, I asked my colleague Craig DeForest to coach me through that personal work. 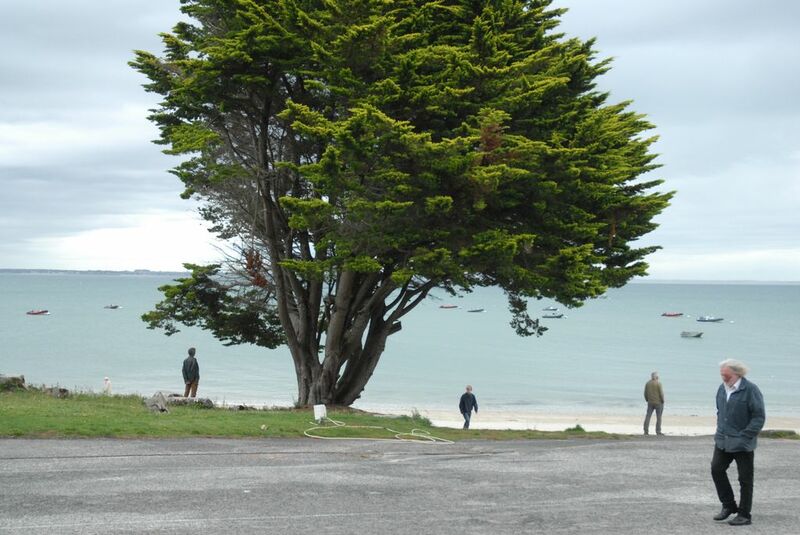 Since it was my first visit in Brittany, I engaged in the process with no preconceived idea about the place, its people, or their past and future needs. I purposely held the attitude and curiosity of an explorer, trusting that what we needed to learn would emerge out of the place itself and the collective intelligence of the group. I aimed at creating a collaborative and co-creative environment where everyone involved could feel s/he had a contribution to make. I saw my role as one of orchestrating the process and guiding the participants in shared reflections and inquiries to help them gain new insights about 1) their professional practices; and 2) the vocation of Crucuno and the role the ecovillage project could play in regenerating the village and the surrounding area. Awareness of the greater potential a project can realize when it is anchored in a deep understanding of the identity, vocation and potential of a Place and when it is understood as an instrument for regeneration (versus ‘an end in itself’). Understanding of the need for design-built professionals to shift from focusing on ‘things’ and problem solving to focusing on potential. Appreciation of the need to let go of professional ‘ego’ and preconceived ideas and, instead, tune in to what a “Place” may reveal of itself. Understanding of the benefits the use of systemic frameworks provide in guiding and expanding the inquiry and thinking process about a project. Awareness of the importance of self-reflection in regenerative work. Engage in deeper reflections about Place and the regenerative potential of the project. Increase the level of collaboration, cooperation, support and sharing. Be in service of Places and Communities. Continue to explore their regenerative role as professionals. Except during my presentation on the first morning and small-group project activity on day 2, we remained in a large circle thus creating a sense of unity and wholeness at the group level. This sense of wholeness was not broken by the departure or arrival of a few participants throughout the 3 days. At the beginning and end of each morning and afternoon session, we asked participants to check-in or out by sharing one single word that came to their minds. The approach was not only effective in getting the pulse of 30 people relatively quickly but, more importantly, it helped each person focus on the essence of what s/he was thinking/feeling/processing; this created a collective picture of where the whole group was at different stages of the process. 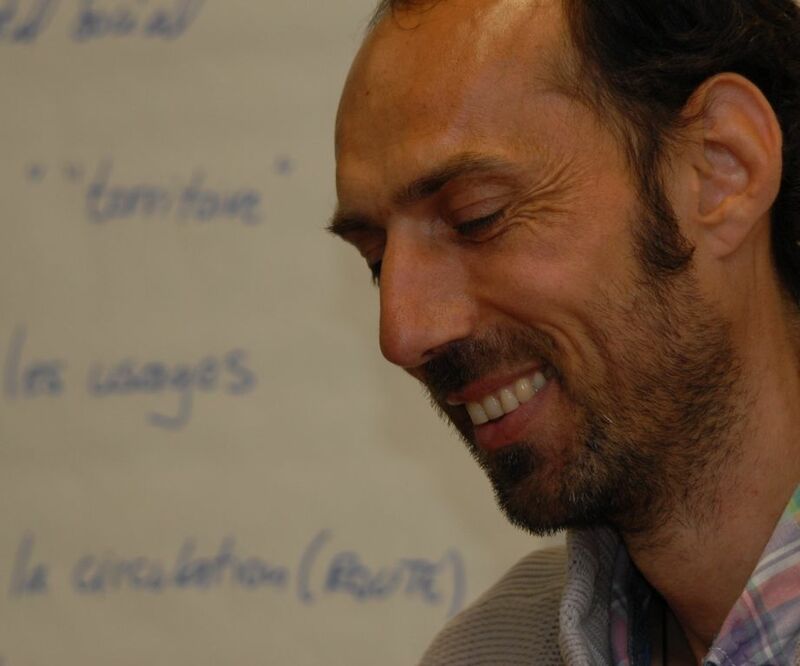 Such carefully designed processes, crafted questions and mindful intentions for the workshop are essential ingredients in creating a powerful container for co-creation and emergence (and are typical of the work of regenerative practitioners who have trained with the Regenesis Group). Intertwined with all of these design elements was the palpable energy of the place itself. Crucuno and its megaliths are unique: the massive dolmen at the center of the village, the “Quadrilatere” not very far from it (another impressive megalith site) and the stories that a local shared all had a huge impact on the group experience. We all felt this unique energy and the sense of Place when visiting the village (you can read about Crucuno in PART 2). The theme of the megaliths remained ever present in our conversations to the extent that some people felt that an over emphasis on them was, somehow, taking us away from our main purpose—that was to uncover the distinctive characteristics of Crucuno and its vocation. Their mysterious aura is indeed impossible to ignore and is reinforced by the fact we know so little about them. During the afternoon of the last day, a few of us met to debrief our experience and discuss possible next steps. Many participants shared their “positive frustrations” about the fact they felt they had only skimmed the surface and that they were still hungry to learn more about the regenerative approach. A few had assumed the workshop would be a conventional training and had come with the intention to learn a methodology and specific set of tools they could apply afterward. This, however, had never been the intent and in the future, I need to be paying more attention to the way such a workshop is being advertised. My objective wasn’t to deliver a training and I did not expect participants to fully grasp the regenerative frameworks that supported our inquiry. One of my goals was to give participants a sense of the potential of the approach. But more importantly, and as stated in my purpose statement and the “system of products,” my intention was to mainly engage them in a reflection of the greater potential a project can realize when it is anchored in a deep understanding of the identity, vocation and potential of a Place and when it is understood as an instrument for regeneration. I wanted them to appreciate how a shift from focusing on the functional aspects of a project to focusing on how Place and its vocation can unlock the energy around a project and uncover possibilities beyond what could have been assumed at the onset. Considering the desire from many in the room to continue the learning process, I believe we began to realize this objective. Building on the momentum, I suggested the University Terre&Mer (UTM) to create a Regenerative Lab under their umbrella to continue to support the ecovillage project of Crucuno. I committed to work with members of the Regenesis Group to create a course in French that incorporates core elements of The Regenerative Practitioner Series in addition to a “Story of Place” applied training on the village of Crucuno—the whole thing delivered through the Lab. I also plan to work with UTM to define the organizational principles of the Lab, which of course needs to operate as a regenerative entity. UTM will search for funding to support the activities of the Lab and will organize a second workshop on Regenerative Development next year. I want to thank my colleagues Ben Haggard and Joel Glanzberg from the Regenesis Group and Craig DeForest, an independent consultant, for their input and support as I prepared for the workshop. Their suggestions on the process and their help in preparing me to facilitate it were tremendous. 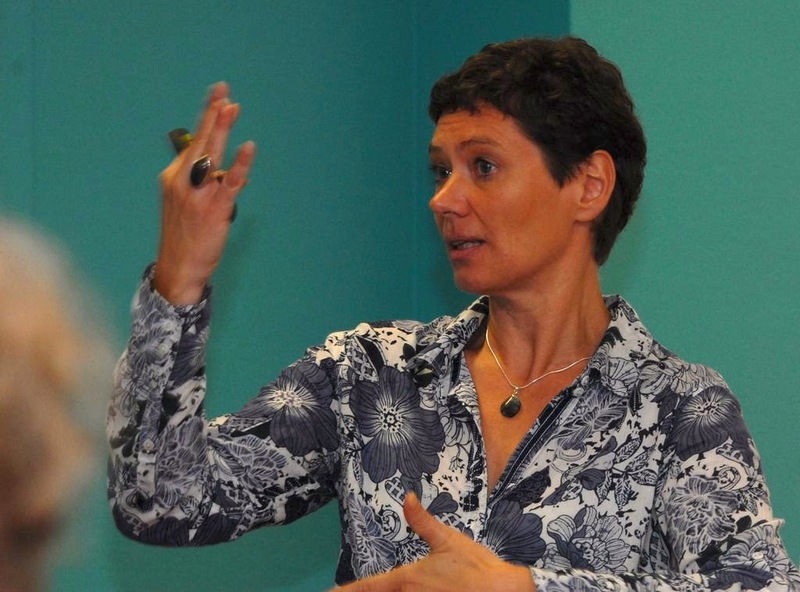 I am deeply grateful to Anne Monmousseau who saw the potential in presenting the Regenerative Development Approach to a French audience and who fully trusted my ability to deliver a powerful learning experience. There is no magic in that, considering the quality of the events offered by UTM to support the transition to a more sustainable economy, the organization is able to attract people of integrity and high-level consciousness—a strong element that contributed to the positive outcomes of the workshop. Many thanks to the UTM staff and other helpers, who took care of all the logistics, captured pictures, and recorded the event, which allowed me to concentrate on my work. In my previous post, I suggested that the process of reframing is essential to opening the door to new possibilities for the future when addressing the root causes of complex problems. The ability to reframe is key to creating disruptive innovations that have a lasting and positive impact on society. Building up on this idea, this new post focuses on generative strategies and the unfolding of solutions for increased value creation. The adjective ‘generative’ means ‘able to produce,’ as in, ‘the generative power of life force’. Generative strategies are life giving because they unlock the potential existing in a system. They emerge out of a learning and creative process in which an organization or group of stakeholders challenge business as usual, disrupt the status quo, and reframe their challenge or situation. Generative strategies deliver outcomes at the whole system level and create value for all key stakeholders involved and beyond. 3) The ‘marriage’ of two different library organizations operating collaboratively under a same roof: the Martin Luther King Library in San José, California. The City of Portland has gained an international reputation for being a leader in the deployment of creative approaches for sustainable stormwater management . Traditional approaches to stormwater management consist of building sewer infrastructure systems to manage sewage and stormwater and prevent overflows into rivers and streams. Prompted by an environmental lawsuit in 1991, the State of Oregon and the City of Portland agreed to build a new Combined Sewer Overflow tunnel on the East side of the Willamette River, for a total cost of $1.4 billion. The new “big pipe” — a tunnel of 22 feet in diameter and six miles long, which was completed in 2011, currently manages more than 94% of the volume of combined sewage and stormwater that used to overflow into the Willamette river . While such infrastructure projects provide an important service to urban communities, they are very costly and cause environmental problems when heavy rainfall exceeds the storage capacity of the pipes and untreated sewage, stormwater and other toxic wastes get discharged into waterways, creating risks for human health and the health of watersheds. In Portland, I have heard that the new CSO would run at almost capacity while just completed. Realizing that the on-going focus on building “big pipes” is a financially and ecologically unsustainable strategy in the long-term, the City of Portland actively sought a more creative and more sustainable approach to its stormwater management problem — one that does not consider stormwater as a waste but instead as a precious asset for the community. In 2006, Portland’s Bureau of Environmental Services (BES) launched the Clean River Rewards program — an initiative that engages the community in the management of stormwater at the source, on private properties . BES grants stormwater utility discounts and provides financial incentives to property owners who invest in stormwater green infrastructure projects. The management of stormwater requires property owners to disconnect their downspouts from the sewer system and manage stormwater with green solutions such as rain barrels, cisterns, rain garden, bio-swales, and green roofs. The program generates a whole range of benefits and positive outcomes for the municipality and the whole community. First, by leveraging private investments, the City is able to reallocate scarce resources to the projects that need them the most. Second, onsite stormwater management techniques create many environmental benefits such as cleaner rivers and streams, healthy watersheds, and wildlife closer to the urban environment. Third, green infrastructures are aesthetically appealing and increase the value of the private properties. Finally, the program supports the development of a local green economy and, potentially, the creation of new jobs, as property owners seek the service of suppliers and contractors to implement the stormwater management projects. The program was certainly not easy to implement and required a shift in the way diverse stakeholders saw their respective roles within the community. For instance, some citizens believed it was not theirs but the responsibility of the City to manage stormwater infrastructure. The community had to be educated on the needs to improve the quality of the watershed and on the benefits of green infrastructures. In addition, not any green infrastructure can be implemented on a given property due to soil characteristics and other physical attributes; thus, the involvement of a technical expert is required to guarantee the correct project design. Despite many apparent barriers, internally within BES and, externally, within the community, the program was nevertheless successfully launched; it included the city’s financial incentives and discounts as well as access to relevant resources and a new online registration process for property owners. “The Brattleboro Coop is a Grocery store that wanted to build a high performance LEED building. In particular, they wanted to generate innovative solutions to their energy use. It was observed that the energy expended in shipping food to the store was far higher than the energy used to operate the building (an average of 3,000 miles per bite of food in New England.) Moreover, their high dependence on shipped food made their business highly vulnerable to disruptions in the supply chain (e.g. a trucker’s strike, fuel costs). The project became one of engaging them in a process that looked at the energies involved in the system as a whole. What strikes me in this story is the particular way the challenge was reframed, beyond the short-term need to reduce energy used in the building, to encompass a broader long-term vision that considered the new role the Coop might play within its community. By creating new relationships, the Coop was able generate multiple and diverse outcomes: the revival of a community through the creation of local jobs; the respect of the “place” and its ecology through local agriculture; new community services; and overall, a healthier and more resilient community. I want to emphasize Bill’s last point that “the building process became a catalyst for a long-term and living system perspective.” Any project, initiative or strategic planning process can become a catalyst for the development of generative strategies. The process requires a shift in thinking from ‘fixing a problem’ to uncovering the potential already present in the system; a willingness to ask new questions grounded in a whole system perspective and a long-term view; that an on-going focus on delivering outcomes for the whole system as opposed to achieving isolated goals. San José Martin Luther King Library (King Library) is one-of-a-kind in the United States: never before has the ‘mariage’ of two such different institutions as a university library and a city library been attempted. Allowing a community of patrons as diverse as young children, teens, senior citizens, university students and faculty to meet under the same roof is a revolutionary experiment that redefines a library’s mission as one of supporting a whole community, with all its diversity. The idea of a joint library was born in 1996 from the minds of two visionaries – former San José mayor Susan Hammer and former San José State University president Robert Caret – who successfully broke the pattern of indifference and disdain, which had been representative of the relationship between the two entities over decades. Indeed, on the one hand, the city of San José had been struggling over the years with urban decay downtown; the university, on the other hand, faced internal cultural changes and had become very insular. Very little was shared between the two institutions. However, with Caret and Hammer, things began to change. On her side, Hammer viewed the urban university as a main “player” in restructuring downtown. On his side, Caret considered San José State to be a “metropolitan university” and started to develop partnerships that benefited both the university and the community. Both the city and the university had inadequate libraries and were in need of more space; neither of them, however, had a budget that permitted them to expand on their own. Both Hammer and Caret realized that by bringing their resources together, they could build a landmark building that neither could afford alone. The result was a $177.5 million library jointly funded by the university and the city. The challenges faced by the King Library project team were daunting at many levels: contextual, operational, organizational, cultural, procedural, technical and architectural. Because there was no precedent for a joint library, they had to innovate to combine their respective operational needs into a single set of requirements, while maintaining the integrity of two completely different cultures. The library had to provide “seamless services” to its users. But the novelty of the concept was such that many believed the experiment would fail. Opposition to the project quickly developed on both sides: The difference of users’ needs – from a graduate student working on a thesis to a toddler playing near-by – was perceived as a gap that could not be filled. Yet, despite the complexity of the project and the inherent uncertainties faced by the “two-headed” client and the project team, the King Library project was an overall success and the facility was delivered on time, below budget and without a single claim. King Library is not the result of a miracle, as some people believed. The project owes much of its success to an outstanding facilitation process by local architecture firm Anderson-Brulé Architects (ABA) that was hired to facilitate the feasibility study and the development of a joint operation plan and remained an active participant until the completion of the project. When, at the earliest stages of the project, the question in everyone’s mind was “What if…,” ABA challenged the client team to answer questions such as: “How would you do this?” “What gets in your way?” “What would stop you?” “How could you move past that thing that stops you?” The focus on “how” provided a structure to librarians’ discussions and ensured that the team members were maintaining their focus on important questions. ABA encouraged the librarians to work in a creative way, while also providing a structure that allowed the librarians to slowly adapt to their challenge. The more the librarians interacted with one another, the more positive feedback was created, which reinforced the meaning of their collaborative activities. The earlier tensions within the project team slowly evolved into “creative battles” for solving problems in a way that benefitted both organizations. Throughout the process, the client team developed a new “identity” that was formulated around a new operational, functional and cultural personality. The team’s emerging identity and collaborative attitude became contagious and was re-emphasized at each main project phase, as new participants got involved. The project collaborative philosophy helped overcome many obstacles and enabled the alignment of the goals of hundreds, if not thousands, of people involved in making King Library a reality. Shift in mindset — from ‘business as usual’ to believing something greater can be achieved. The vision becomes an attractor and a powerful force that brings life and creative energy to the project. Long-term view — because the sustainability and resilience of living systems operate in the long-term. Potential-driven process — these projects do not focus on solving a given problem but on unlocking the inherent potential that exists in a given organization or system to uncover new possibilities. Generative strategies emerge out of the context and history of the place and/or system. Relationship-driven process — the value of collaboration and partnerships is recognized as essential to achieving greater outcomes for the whole community and the environment. By pulling together the necessary skills and resources, new ties are created that are in themselves, generative. Open system — these projects redefine and expand the problem’s boundaries to generate higher value. Reframing — the questions we ask influence our answers. All generative processes are learning processes that are inherently transformative. Focus on the ‘how’— there is nothing more inspiring than joining our efforts to co-create solutions that are truly innovative for the greater good. Trust — often not present at the outset of a project, trust between stakeholders must be consciously developed to enable a cooperative culture. Transformative — generative projects shift the way participants see themselves and the role they play within the larger ecosystem. Development of new capacity — Generative projects offers a creative learning environment where new skills and capacities are being developed. EPA (2009). Portland Launches a Stormwater Marketplace. Nonpoint Source News-Notes. February 2009. Issue #86. Reed, Bill (2007). A Living Systems Approach to Design. Keynote Address for the AIA National Convention in May 2007. Benne, Beatrice (2005). Doctoral Dissertation: Managing AEC Project Organizations at the Edge of Chaos: An Analysis of AEC Projects Adaptive Capacity from a Living Systems Perspective. University of Berkeley. (Note: for King Library story see Chapter 5). The Stanford Graduate School of Business offers a multi-disciplinary course called Entrepreneurial Design for Extreme Affordability. In 2007, the course challenged student teams to design an incubator for developing countries that would cost less than 1% of the price of a traditional $20,000 incubator. Some members of the student teams were sent to Nepal to visit local hospitals, speak with stakeholders, and inquire about users’ needs. During their visit, the members of one team observed that the hospitals had many baby incubators yet these incubators were empty. Intrigued, they inquired with the local doctors and staff about why it was the case. They learned that while price of the incubators is important, hospitals have to deal with the fact that 80% of babies in Nepal are born at home; women living in the countryside and giving birth to a premature baby are usually unable to bring their baby to the city hospitals because it is too costly to do so and because they have no means to transport their baby safely. Indeed, one of the main criteria for babies’ survival is hypothermia: babies are not able to regulate their own temperature; hence babies need a device to keep them very warm. This was a big “Aha” moment for the student team who realized that the ‘users’ were not necessarily the hospitals but mothers in rural areas who need to keep their premature babies warm; however, there isn’t always electricity in rural areas to use a traditional incubator. Moreover, mothers potentially need to transport their babies safely to a hospital for further care. Hence, the team reframed the problem around the specific needs of mothers living in the countryside, with no electricity. • How does a design team learning process evolve from focusing on developing “a cheap incubator” (I like to think of it as a “cheap box”) to a safe warmer device that saves lives? In other words, how does the process of reframing take place? And why is it important? • Why is it that only one of all the teams involved in the design challenge came up with such a reframing of the challenge, hence a completely different solution to the problem? • Why is it that the Embrace team could not find any interest for taking their innovation, i.e., the “low cost infant warmer,” to the next stage of development? Indeed, the organizations involved with the course thought that, “because governments in developing countries are trying to get women to give birth in hospitals instead of at home, the group thought Embrace was “too much for a home setting”. In other words, despite addressing a ‘real’ user need, the Embrace solution did not meet the ‘accepted’ perceived needs and requirements of the main stakeholders. I will not answer these questions directly here. I will only says this: I believe that the teams, groups, organizations, communities, local governments and so on, who are able to successfully address the complex challenges of our times are the ones who are able to reframe their problems — usually by reframing a technical problem (e.g., a cheaper “box”) into an adaptive challenge (e.g., saving babies lives); by moving away from addressing symptoms to uncovering root causes of the issues; and by believing that solutions to deeper issues exist and are achievable. This is indeed hard work. The process is inherently collaborative and requires us to challenge our assumptions and beliefs. It forces us to overcome our doubts and fears about challenging the status quo and fears of potential failure. It demands that we rise to our highest potential and address the “impossible.” But as the Embrace team demonstrates, even what seems impossible can be overcome — with a combination of love, empathy, collaboration and hard work! This is the way I want to address complex problems. Will you join me? Note: I first heard about the story of the Embrace team and of their innovative solution by watching a documentary video produced and realized by Corey Ford, an adjunct faculty at the Design MBA at the California College or the Arts, while I was sitting in Corey’s Venture Studio class early on this year. I found this story deeply moving and rich in lessons on how to address complex social issues. It is a success story on how to make a difference in the world. We need more stories like this one. This post is to announce course sessions that my colleague Andrew J. Campbell and I will be co-facilitating this summer. Andrew will be spending the month of June in the Bay Area and we are offering three learning journeys on the theme: The Art of Spontaneity. We have chosen the Mission District in San Francisco near Dolores Park and Lake Merritt in Oakland as locations for our informal gatherings, which will take place outside in the neighborhoods. Please see the brochure for more background on the learning journeys. The cost of the course is $40 per person and does not include lunch. There are plenty of restaurants and sandwich places in both locations for us to get our lunch. ~ Joseph Jaworski, in conversation with Andrew Campbell, 2008. The above quote says it all. Our ultimate goal for this retreat is to give your the tools you need to develop your capacity for intuition, imaginative foresight and creativity so that you are able to tap into your inner knowing and creative source and thus, capable of addressing any complex strategic questions and issues that come your way, both in your personal and professional lives. The course structure is designed to create en environment that facilitates spontaneous insights and authentic learning—learning that integrates explicit knowledge (knowledge in the mind), tacit knowledge (experience) and transcendental knowledge (wisdom). Those who master this capacity can better navigate today’s complex realities while engaging others in co-creating sustainable strategies for the future.